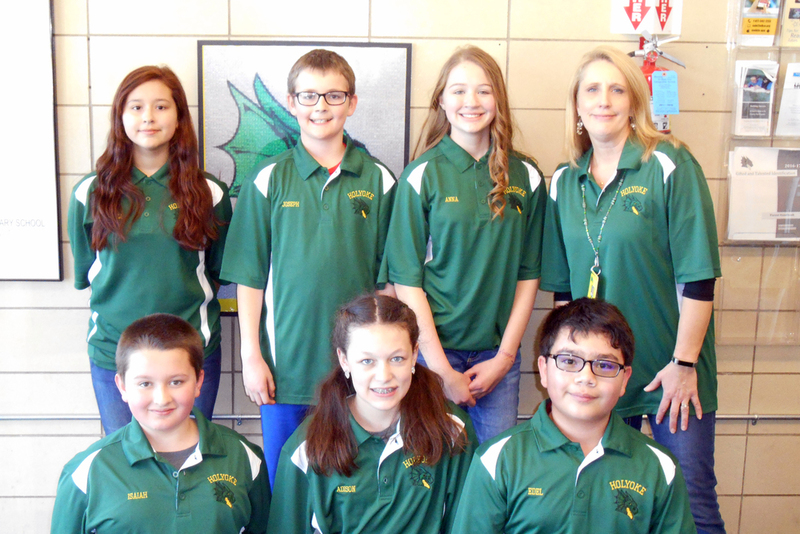 The Holyoke Sixth grade Brain Bowl team competed Saturday in the Colorado/Wyoming State Brain Bowl Tournament at Hamilton Middle School in Denver. Students Andrea Marquez, Joseph Schroetlin, Anna Hayes, Isaiah Rueter, Adison Goldenstein and Edel Ramos qualified for the state tournament as one of the top scoring sixth grade teams in the North Colorado tournament, and were therefore ranked one of the elite sixteen Colorado/Wyoming teams. We are part of the Colorado-Wyoming District for the Optimist Brain Bowl and over 1200 middle school students participate each year. Holyoke won in the first oral round with a score of seven to thirteen in competition with Carson Middle School with Anna Hayes serving as the team spokesperson. The second round was a written test for Holyoke with Adison Goldenstein serving as the team scribe. In the third round, Holyoke tied with Challenger Middle School team B with eleven points each, and Joseph Schroetlin served as team spokesman. In the fourth round of competition, Holyoke competed against Broomfield Heights and lost in a tight race that ended with a score of eight to twelve with Isaiah Rueter as spokesman. In the final round, Edel Ramos was the spokesperson as Holyoke Competed with Challenger Middle School team ending with the score of nine to twelve. Knowing that their scores in the oral rounds put them into contention for the elimination showdown, Holyoke students were on pins and needles waiting for the announcement of which teams would advance. However, their hopes were dashed when they were beat out by teams who scored higher in the written round. Our students were proud to represent our school and community and demonstrate that Holyoke values academics and intelligence. The Brain Bowl team would like to thank the Holyoke Fire Department for escorting the team van out of town with sirens and fanfare. They would also like to thank Stacy and Tawney Rueter and Tyrell Brownfield with Colorado Livestock Carriers for the team polo shirts. Finally the team would like to thank the parents who came to cheer and support them and for Mrs. Loutensock who for serving as the coach.